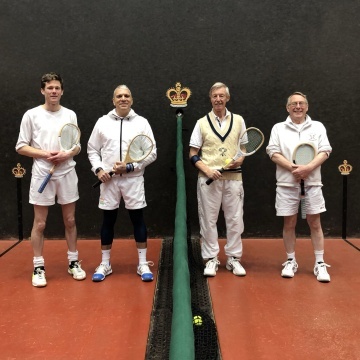 The IRTA began a busy 2019 with a fixture against the Jesmond Dene club in Newcastle. The travelling contingent comprised Roland Budd, Rustom Manecksha and Jack Woods, who were joined by Irish players Tony Penny and Peter Dean arriving from the south of England. On Friday evening, the three from Dublin had singles fixtures which saw the IRTA 2–1 down to start the fixture (see results below). There were a number of singles and doubles matches played on the Saturday, with some very close encounters at the start. Budd started the day’s play in typical Budd fashion, ensuring he was down by 8–2, only to win 8 games on the trot and take the match. As any seasoned IRTA member will acknowledge, Roland is generally considered ‘evens’ to win from such perilous positions. Just as Camden Riviere and Tim Chisholm were winning the world doubles championships on the other side of the world in Australia, Budd and Manecksha were holding their own on court for Ireland as then edged a fierce and impressive contest 10–9. Penny and Dean edged another doubles thriller 10–9, needing a gutsy drive into the Dedans from Peter Dean to seal it at 9–9 and 40–40! Some further good tennis was played as the fixture went to the wire, with the overall score a 6–5 victory for the IRTA. In the evening we were joined by the Mullan family, originally from Northern Ireland. 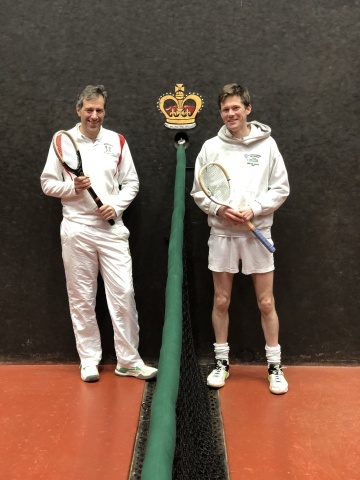 Dennis is a long-standing member of Bristol and Bath RTC and his sons Henry and Alex are both impressive tennis players and now IRTA members who we hope to see at future events. Some casual but competitive doubles matches were played on Saturday evening and Sunday morning (results below) before the travelling contingent departed for the airport after a satisfying and enjoyable weekend on court. Jesmond Dene provided a fantastic atmosphere for us to enjoy the weekend’s play, with local players giving us a warm welcome and Scott Blaber and his family organising a thoroughly enjoyable weekend. Many thanks to JDRTC and Scott for their welcome and their hard work in making the weekend a success. We hope for a repeat fixture in the near future!